Over the past few years, binary options trading has gained wide acceptance among many traders from all over the world. The explosive growth of this industry has also given rise to numerous niche industries designed to support binary options traders. One such industry is that which develops trading robots to help automate the trading process. However, with so many automated trading solutions coming onto the trading scene, it is difficult for beginner traders to tell apart the legitimate ones from the fake ones. In order to give traders a heads up, we have conducted an in-depth review of many binary options trading robots. And a recent entrant which caught our attention is the “Trusted Binary Bot”. Promising to be different from all automated trading solutions that exist on the internet today, the Trusted Binary Bot claims to offer innovative ways of managing your binary options investments. So can it live up to its claims or is just another scam? Read on to find out. 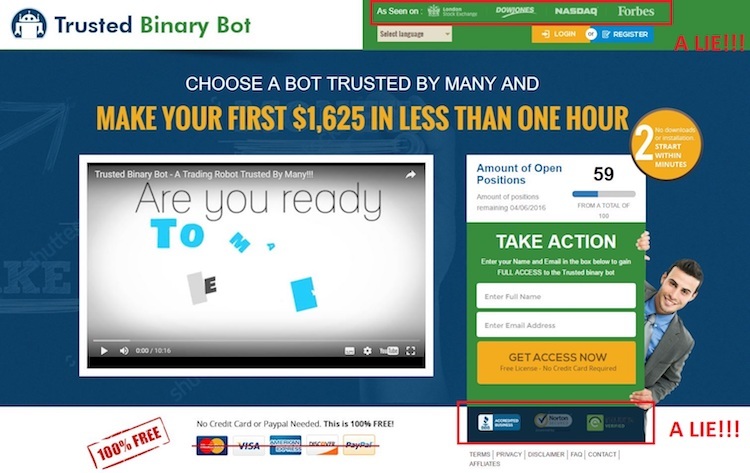 Based on what we have seen on the promotional video for the Trusted Binary Bot, this is an automated binary options trading software that was developed by 3 individuals, Peter, Alfred and Sam. Apart from their first names, no other information is available about the developers of this trading system. To us, this is one of the first red flags about the Trusted Binary Bot as there is no way anyone can check the authenticity of the claims made by the presenter in the promotional video. In addition, this kind of modus operandi is typical of that we see on the internet. To cut to the chase, Peter as the presenter depicted in the promotional video claims that he and his co-developers had found a back door for trading binary options. It is this back door that has been incorporated into the Trusted Binary Bot. The Trusted Binary Bot uses an algorithm to look for trends in the financial markets. It is based on the concept of “Herd Mentality”, a concept which rests on the hypothesis that people generally tend to follow trends because they want what everyone else has. Programmed to look specifically for trends, once the software recognizes a trend in the market, it will act instantaneously by placing a trade automatically way ahead of what other wall street traders are doing manually. Meaning since you are first in the line of the flock, you will be reaping the most profits from the trend in the market. After analyzing the various claims made by Peter, we notice several problems and inconsistencies with the explanations provided. First of all, the big league boys from Wall Street no longer make trades manually. From the Hedge funds to the established banks, most of the trading done today by institutional investors is high-frequency trading or HFT for short. Our desktop computers and internet bandwidth cannot even remotely compare to the speed which high-frequency traders are operating at. Secondly, the Trusted Binary Bot only works with trends meaning trading the news is out of the question. By implication, it also means that the Trusted Binary Bot is prone to errors. Trends can reverse suddenly when the impact of news releases is big enough to cause a ripple effect in the market. And since the Trusted Binary Bot only trades on trends, it can also be trading based false premises meaning you will be making losses when you should be making a profit. All these key questions that we have raised above have not being addressed by Peter in the promotional video and this raises doubts about the ability of the Trusted Binary Bot to actually perform what Peter claims that it can do. To access the trading app, you will need to register first by filling in the provided form. After receiving the trading app, you will be required to select a broker to trade with from their list of recommended brokers. And before you can start trading on autopilot, you are also required to make a minimum deposit of $250. From our observations, we find that the Trusted Binary Bot is most likely to be a scam. This is due to the fact that it doesn’t address some the fundamental problems which traders face when they are trading the dynamic financial markets. Our conclusion is it is nothing more than a gimmick to get unsuspecting traders to sign up with participating brokers and to scam them out of their money and as such recommend our readers to stay away from anything to do with the Trusted Binary Bot. 7 Binary Options review: Trusted Binary Bot: 1 stars.